Kick off your visit on the 31st (Fri): test your team's savvy at The Escape Game Houston and then see the interesting displays at Space Center Houston. For ratings, other places to visit, traveler tips, and more tourist information, read our Houston trip itinerary app . Use the Route module to find travel options from your starting location to Houston. In May, plan for daily highs up to 84°F, and evening lows to 68°F. Finish your sightseeing early on the 31st (Fri) so you can travel to Las Vegas. On the 1st (Sat), shop like a local with The Strip, then enjoy breathtaking views from Eiffel Tower Viewing Deck, then take in nature's colorful creations at Bellagio Conservatory & Botanical Gardens, and finally admire the local landmark of Bellagio Fountains. 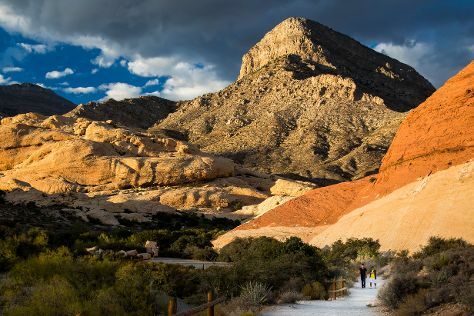 Get ready for a full day of sightseeing on the next day: take in breathtaking views at Red Rock Canyon National Conservation Area. To find where to stay, more things to do, traveler tips, and more tourist information, go to the Las Vegas route builder app . Fly from Houston to Las Vegas in 6 hours. Alternatively, you can drive; or take a bus. The time zone changes from Central Standard Time to Pacific Standard Time, which is usually a -2 hour difference. In May in Las Vegas, expect temperatures between 87°F during the day and 64°F at night. Wrap up your sightseeing on the 2nd (Sun) to allow time to travel back home.